Homoeopathic Drug Pictures, first published in 1942, consists of 125 remedy pictures portrayed with M.L. Tyler’s experience along with quotations from Hahnemann, T.F. Allen, Hering, Burnett, Farrington, Kent, Clarke and others. For every medicine, Tyler presents valuable background information, including history, use and preparation, and often compares each remedy with one (or more) closely similar remedies. Categories: Health, Health and Medicine, Homoeopathy, Mind, Body, Spirit. Tags: homeopathy, 9788131901502, alternative medicine, alternative therapy, complementary medicine, complementary therapy, health, homeopathic medicine, homoeopathic medicine, homoeopathy. In Homoeopathic Drug Pictures M. L. Tyler’s remedy differentials are very useful for clinical practice. Her liberal inclusion of cases, articles, and letters from multiple sources enriches the picture of the remedies and gives this work an encyclopedic scope. 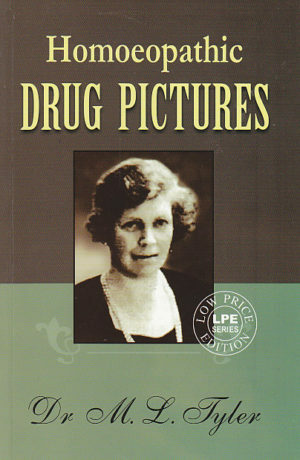 Useful background to each drug picture has been provided with respect to its history, source, preparation, use & comparative aspect. A captivating writing style and sublime description of various particulars make this literature simply fascinating to read. Enjoy the flowing narrative and you will be spellbound by the insightful description of drug action. A sure treat for students who love their materia!